Like the rest of us, Mont-Sainte-Anne is getting older. The historic ski resort 25 miles northeast of Quebec City turned 50 years old this year. And during those five decades, the unique getaway has recorded many firsts. Among them, hosting the inaugural Canadian Winter Games in 1967 and the first Snowboard World Cup Stage to take place in Canada in 1993. In fact, the very next year it became the first mountain in the region to welcome snowboarders. In 1971, the cross-country ski center opened with 90 kilometers of trails. Today, it’s the second-largest cross-country area in North America with more than 200 kilometers of trails. 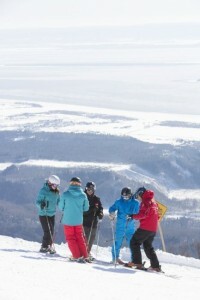 The St. Lawrence River shimmers in the valley below as skiers gather for another exciting run at Mont-Sainte-Anne. The little ski area began with only 10 trails and four lifts, including the first gondola in eastern Canada. Today, the beautiful resort boasts 71 trails, offering fun runs for beginning skiers as well as the most advanced. These are served by nine lifts, including a high-speed eight-person gondola as well as a new high-speed quad that opened in 2014. Western skiers may balk when they discover the summit peaks out at 2,625 feet in the picturesque Laurentian Mountains. But in a strange twist, visitors arrive at the summit and it’s ALL downhill from there, falling 2,000 sweet feet to the valley below. And while Mont-Sainte-Anne averages 187 inches of natural snow annually, it has put in a snow-making system that covers 80 percent of the skiable terrain allowing the resort to boast one of Quebec’s longest ski seasons, closing on April 24 this year. While eastern skiing can be icy and wet, the snow was a light powder when we recently visited. Granted, it’s not the champagne powder of its sister resort Kicking Horse or Fernie, but the conditions were better than the Sierra concrete often found at our local mountain resorts. Since being bought by Resorts of the Canadian Rockies in 1999, a lot of money has gone into new gladed trails as well as improving the snow-making system. This is a great place for skiing or boarding through snowy glades. Children use one of the longest magic carpet rides in Canada during a lesson at Mont-Sainte-Anne’s ski school. The first glade for kids, La Foret Enchantee, opened on the north side in 1997, along with a glade for experts on the south side. There’s nothing quite like sliding through a stand of snowy pines on a clear winter day. The mountain offers three faces, each with a personality all its own. One overlooks the majestic St. Lawrence River. The view from the cable car can’t be beat. The trail La Crete provides a stunning view of the river and Quebec City. On our first day, we took it easy, enjoying the well-groomed runs. The longest, Le Chemin du Roy, is 3 and a half miles long. Mont-Sainte-Anne has a nice beginner’s area, with one of the longest magic carpets in Quebec. 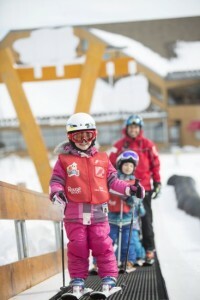 It offers an excellent ski school for the little ones, as well as the rest of us. Most of the easy trails are located east of the gondola. The ski runs on the south face have the most slope, while north side has the easiest runs. The west face offers only natural snow and is serviced by a T-bar. So check to see if the area is open before going there. Expert skiers will be challenged by the black diamond and double diamond runs. The resort has marked 20 percent as more difficult and another 10 percent as extreme. The mountain also offers four terrain parks and a bordercross. A helmet is required in all snowparks. One park, La Cachette, is set in a forest and is lighted at night. And you can’t beat the price considering the favorable exchange rate, which gave us $1.35 Canadian for every dollar we turned in. A day lift ticket costs $76, good from 9 a.m. to 4 p.m. A day/night ticket is $69 and good from 12:30 to 9 p.m.
Night skiing at Mont-Sainte-Anne began in 1986. It has the highest vertical drop for night skiing in Canada. So give Mont-Sainte-Anne a try whenever you’re in Quebec. You’ll be glad you did. Rich Irwin is a freelance travel writer and a member of the North American Snowsport Journalists’ Association.